New varied selection of mineral specimens from all over the world. 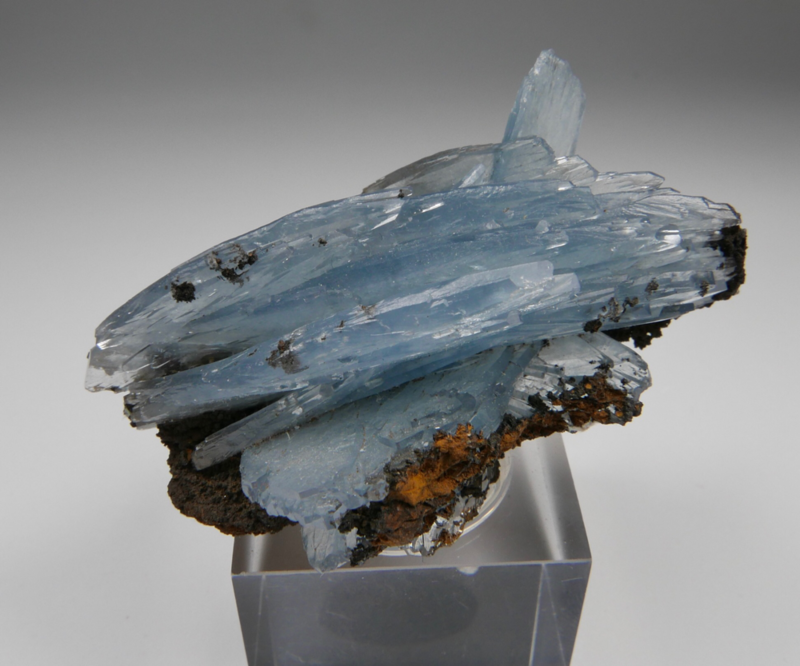 As usual we have posted beside the photos of each mineral specimen a video for a much better characterization and visualization of the piece. Please, don't hesitate to contact us for any inquiry or question. 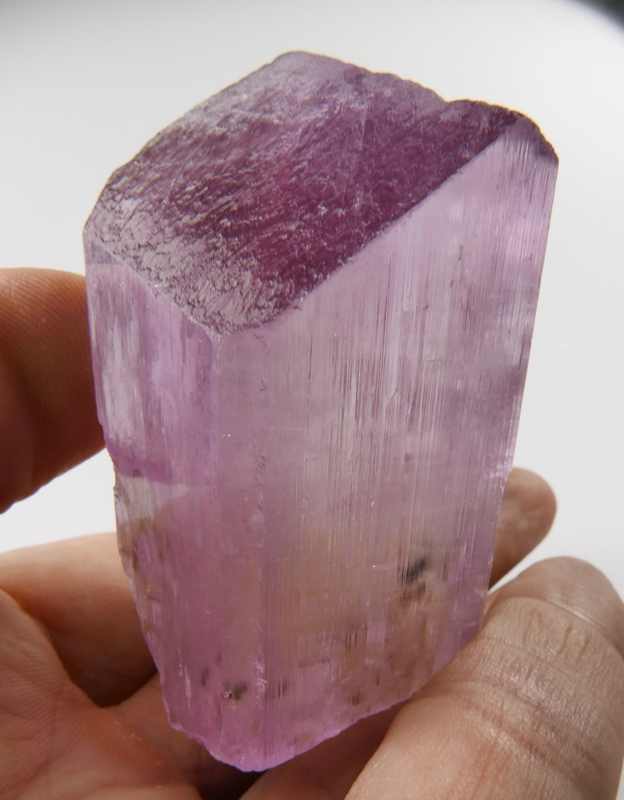 AB01 - Kunzite. Kunar Valley, Kunar Province, Afghanistan. 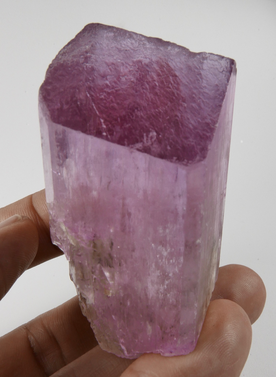 Spodumene specimen composed by two gemmy crystals of Kunzite in parallel growth with very well defined faces and edges. Prismatic crystals with nice pink color and very good transparency and luster. A gemmy Kunzite specimen in excellent condition. Photos taken using white lights lamps and video in conditions of natural light. 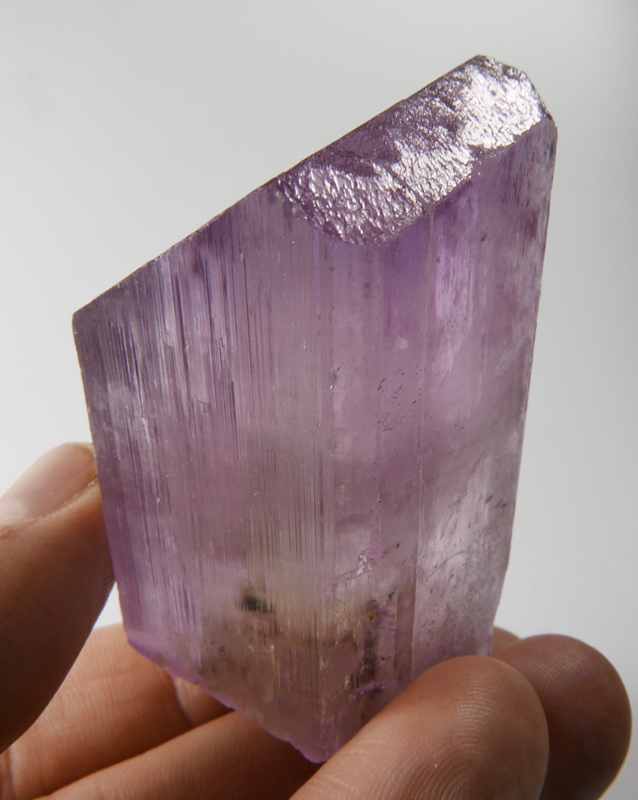 AB02 - Kunzite. Kunar Valley, Kunar Province, Afghanistan. 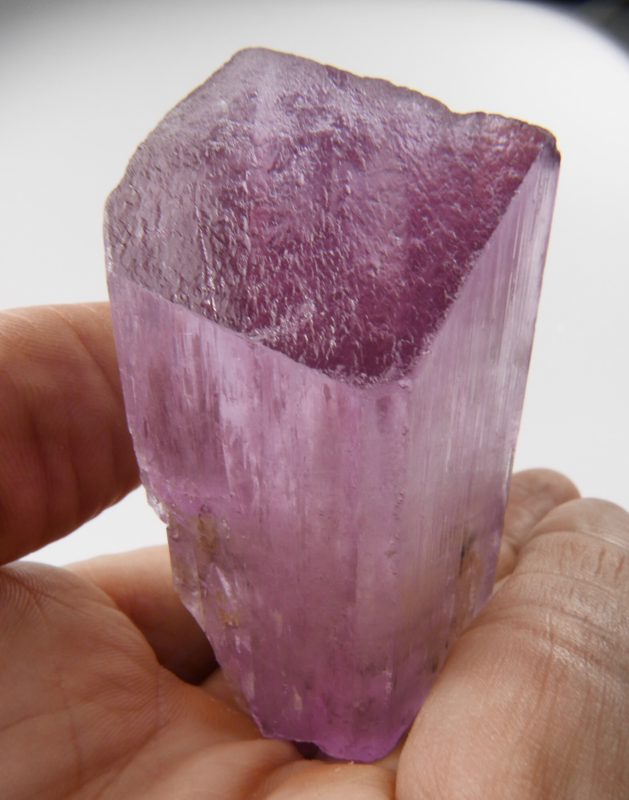 Large prismatic crystal of Spodumene, variety Kunzite, with a nice pink color, very good transparency and good luster. The faces and edges of the prysm are very well defined with a fine and sharp termination. 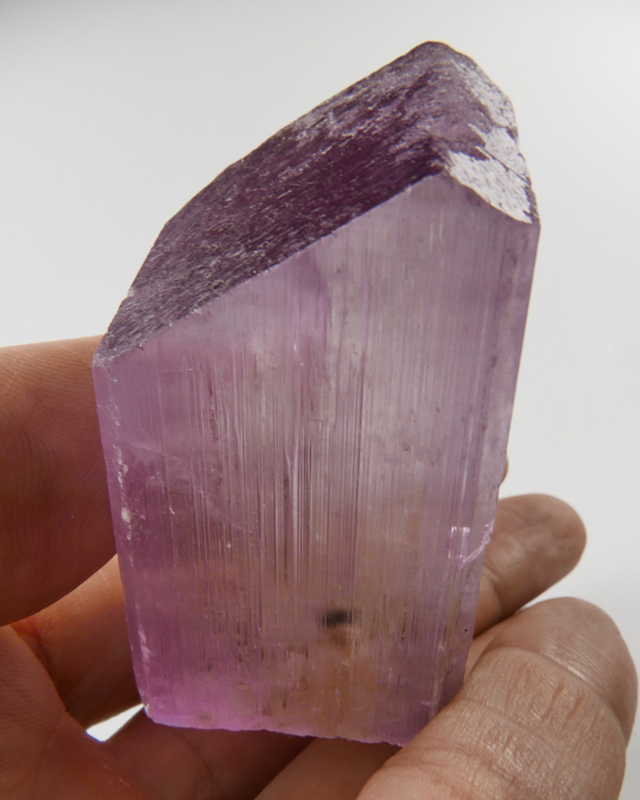 A gemmy Kunzite in excellent condition, no damage. Photos taken using white light lamps and video in conditions of natural light. 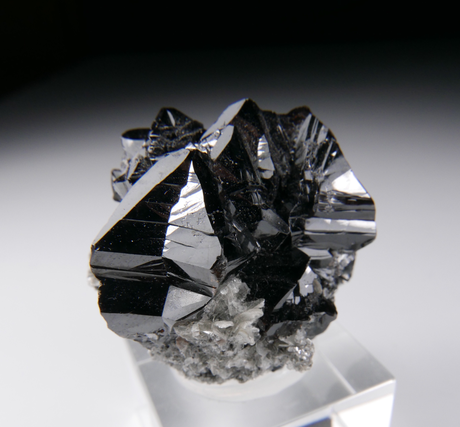 AB03 - Scheelite with Quartz. Támboras Mine, Mundo Nuevo, Huamachuco, La Libertad, Perú. 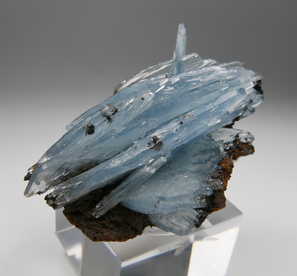 Mineral specimen composed by several crystals of Scheelite nestled on a matrix of crystallized Quartzs. The main Scheelite crystal is 3 cm x 3 cm in size and shows very well defined faces and edges. It is set up in an aerial position composing a very aesthetic specimen. Excellent Scheelite specimen of very good quality. No damage. Watch video. 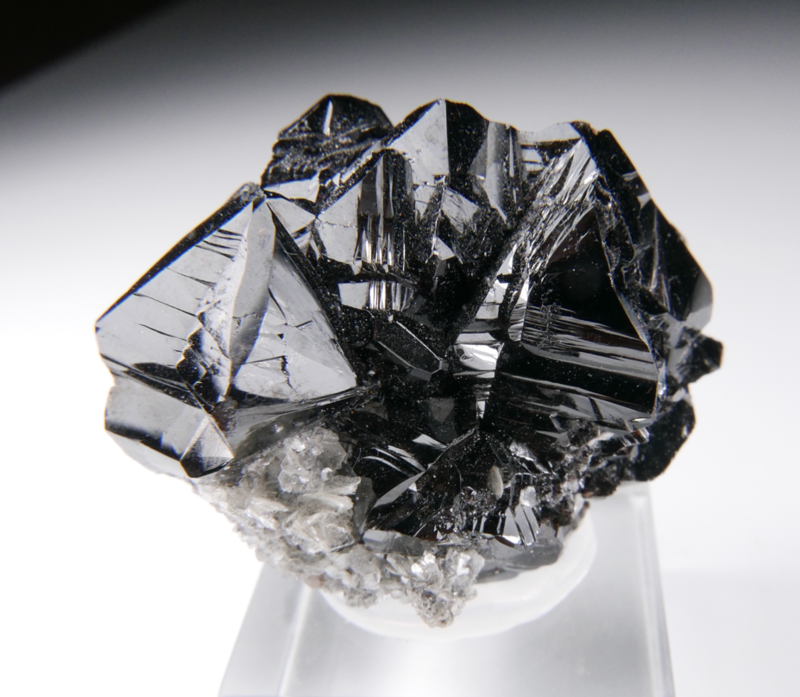 AB07- Cassiterite with Muscovite. Huya, Mount Xuebaoding, Pingwu, Sichuan, China. Excellent Cassiterite specimen composed by a group of twinned crystals attached to a matrix of Muscovite. 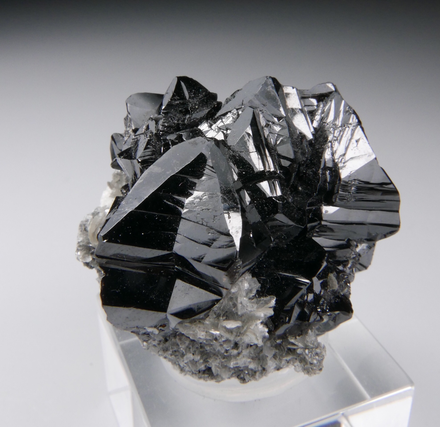 The lustrous crystals have very well defined faces and edges composing an aesthetic Cassiterite specimen in excellent condition. It shows all around. Watch video. AB08- Emerald. Muzo mine, Muzo, Boyacá, Colombia. 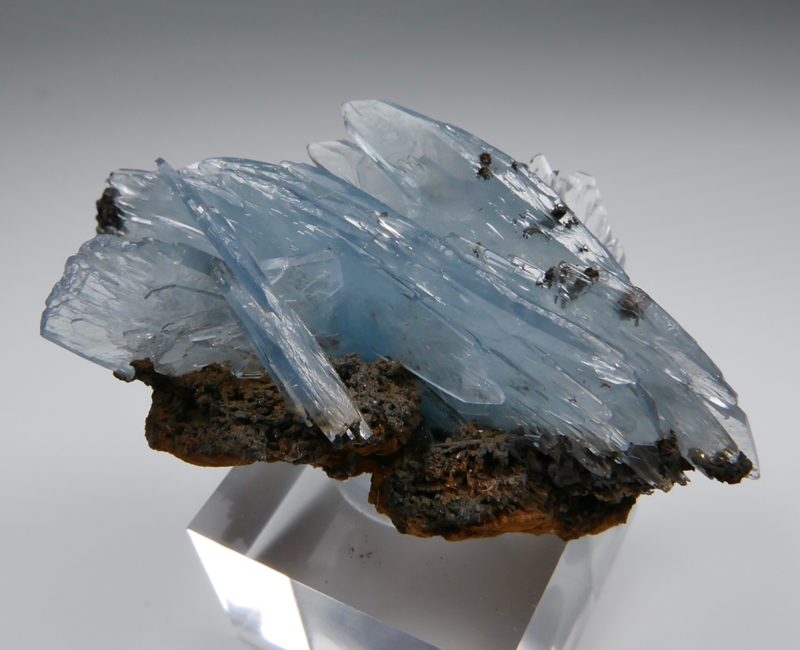 Sharp prismatic crystal of Beryl variety Emerald on Calcite matrix. Transparent and lustrous biterminated crystal with very nice color. In excellent condition. 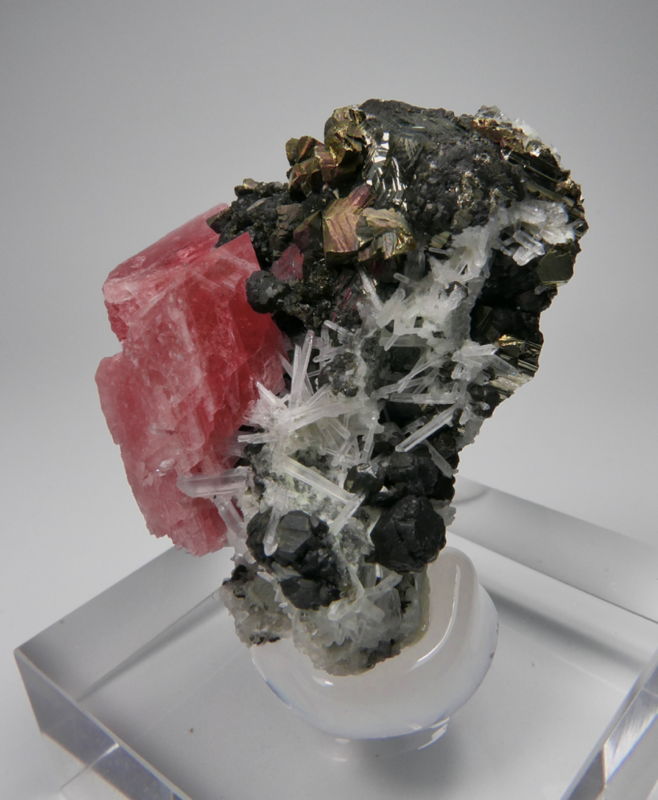 A jewel from the Muzo mine. Watch video. 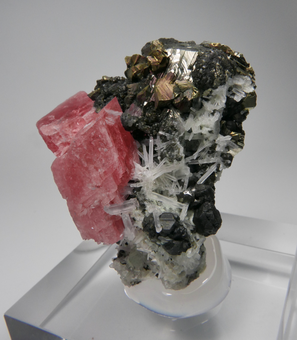 AB11- Rhodochrosite with Pyrite and Quartz. Sweet Home Mine, Alma District, Park County, Colorado, USA. 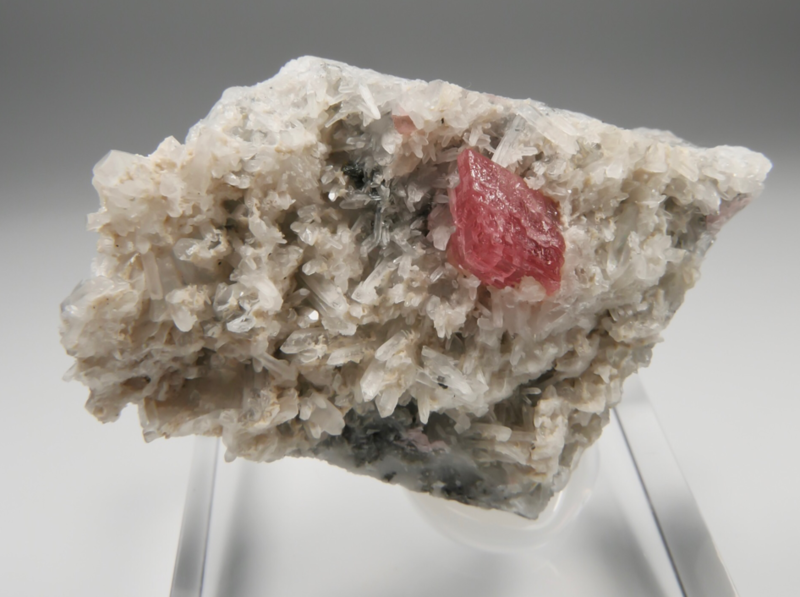 Great Rhodochrosite specimen from the world famous Sweet Home mine in Colorado, closed definitely in 2004. 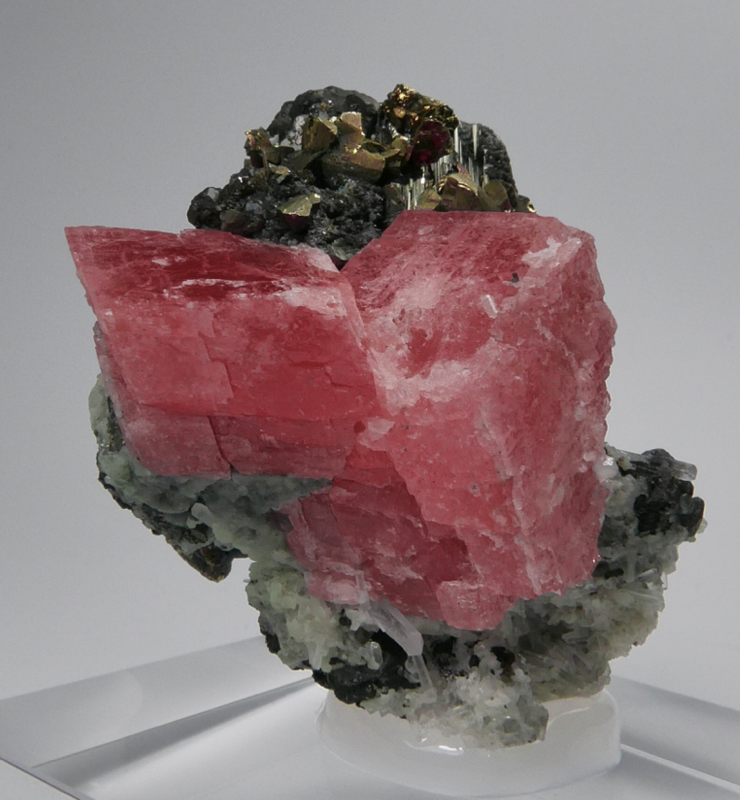 This specimen is formed by two very defined and well formed rhombohedral crystals of Rhodochrosite with a deep red color. The Rhodochrosites stand out and contrast strongly from the matrix formed by Pyrite, Tetrahedrite, Chalcopyrite and Quartz. In very good condition. 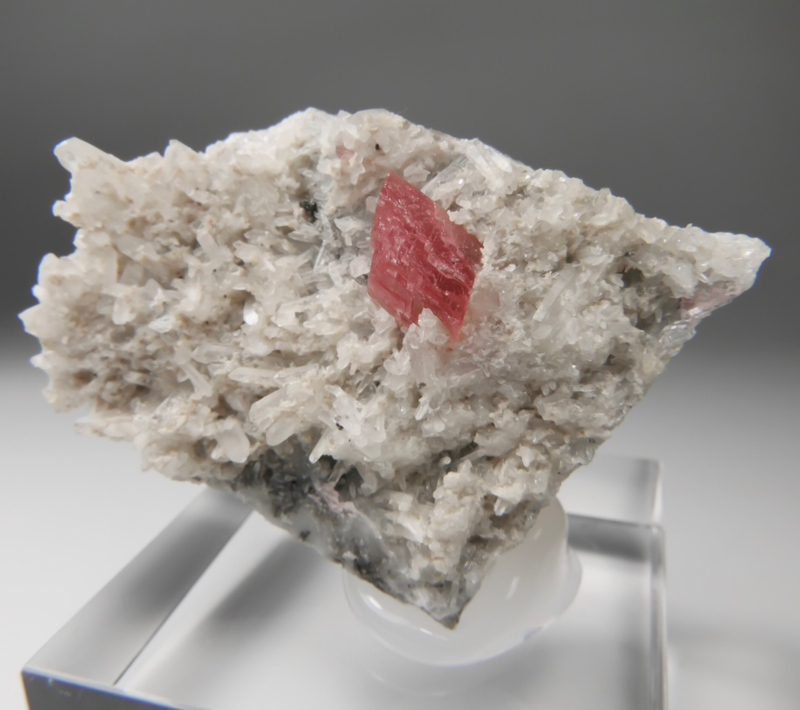 A very fine Sweet Home mine Rhodochrosite specimen. Watch video. 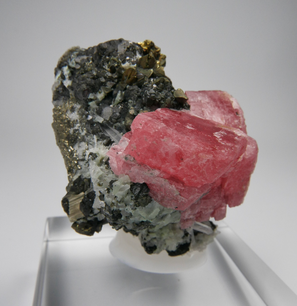 AB12- Rhodochrosite with Quartz. Sweet Home Mine, Alma District, Park County, Colorado, USA. Mineral specimen from a classic locality in USA. The Sweet Home mine has produced many of the best Rhodochrosite specimens for many years. The mine closed in 2004 after several years of successfull crystal mining. 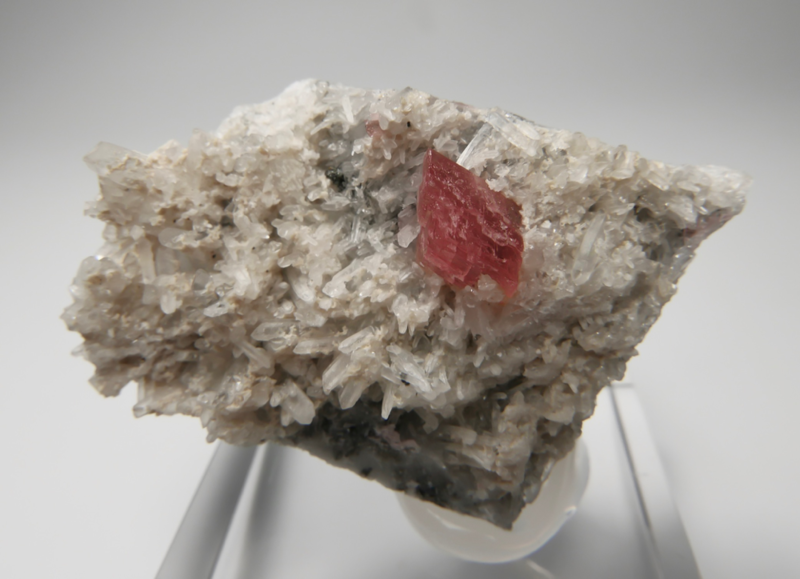 This specimen is a very good example of the Rhodochrosites extracted before the mine closed in 2004. 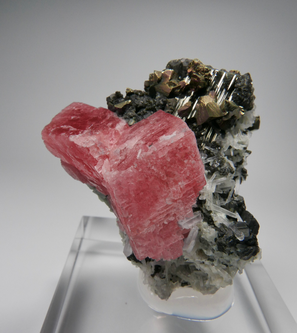 It is composed by a nice rhombohedral crystal of Rhodochrosite set up on a bed of Quartz crystal matrix. Well formed crystal with a very nice red color. No damage. Watch video. 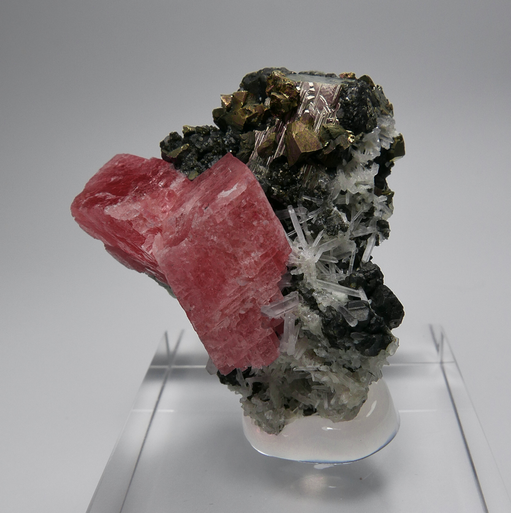 AB16- Rubellite with Quartz. Male, Lampala, Mogok, Myanmar. 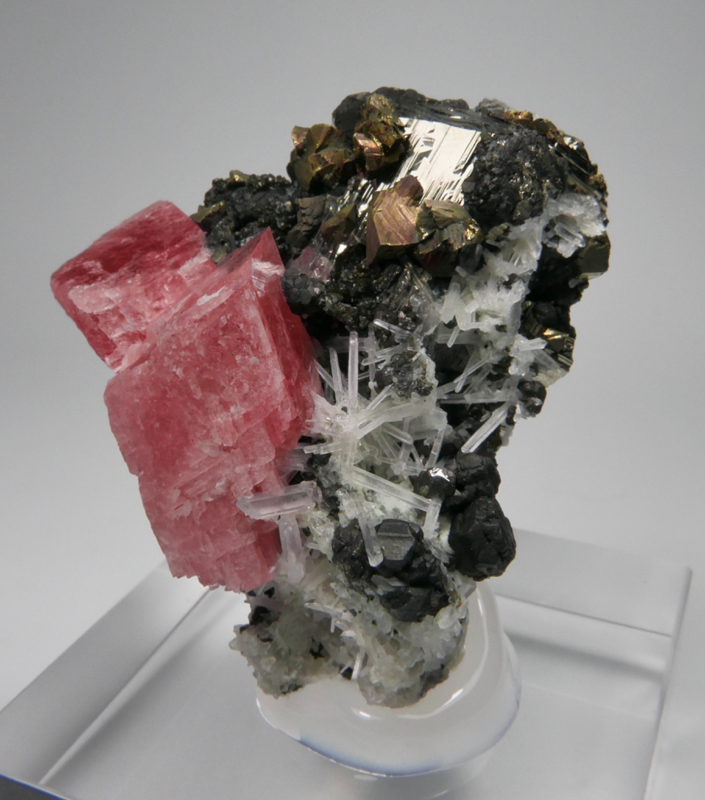 Fine Tourmaline specimen from Myanmar. 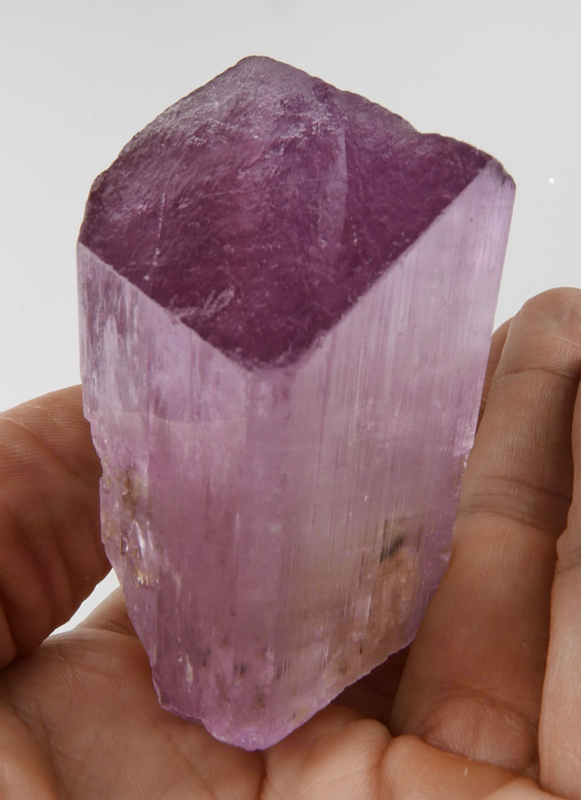 It consists of a gemmy prismatic crystal of Rubellite centered on a matrix on Quartz crystals. Terminated crystal with a deep color, high luster and very good transparency. In excellent condition. Watch video. Specimen composed by an aggregate of Baryte crystals with a deep and uniform sky-blue color. The crystals are very acute and have good terminations. 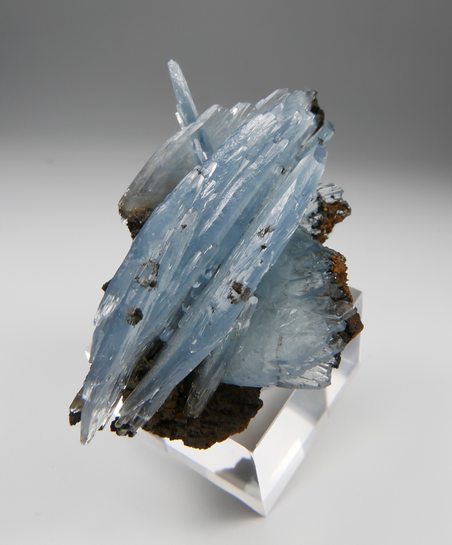 They are between transparent and translucent and very lustrous and are accompanied by a bit of limonite matrix. Very nice mineral specimen in excellent condition. Watch video. AB18- Wulfenite. Stone Crack mine, Kurugtag Mountains, Xinjiang, China. Excellent Wulfenite specimen coming from a new find in China. It is formed by a group of excellent thin platy tabular crystals scattered over the front of a Gossan matrix. The crystals have a deep orange color with very high luster and great contrast to the dark matrix. In excellent condition, no damage. Watch video.